Rejuvenation costs 18% of base mana, which is 683.3 mana untalented at level 80. This is reduced by Tree Form with 20%. The final mana cost of Rejuvenation can be found below. It saves quite a bit of mana, depending on how often you are casting Rejuvenation. Which may be quite alot, cause of the new talent Replenish. If your a druid which indeed wants to save mana when spellcasting then this sure is the Idol for you! Unlike the fact that there are more Idols, I prefer http://wotlk.wowhead.com/?item=40711 over this one. We druids already have pretty insane mana regen, so get http://wotlk.wowhead.com/?item=40711 if you want more healing done then mana saving. Addition/subtraction comes before the multiplicative scaling. So it should come out to ( 683.3 - 106 ) * 0.80 = 461.84 man for Rejuv. Reduces the Mana cost of your Moonfire, Starfire, Starfall, Wrath, Healing Touch, Regrowth and Rejuvenation spells by 9%. Shapeshift into the Tree of Life. While in this form you increase healing received by 6% for all party and raid members within 45 yards, and you can only cast Restoration, Innervate and Barkskin spells, but the mana cost of your healing over time spells is reduced by 20%. Heals the target for 1690 over 15 sec. The term "Base Mana" refers to how much mana your character has before it is modified by Talents, Intellect, Enchants and other item effects. Quite a few spells require a percentage of your base mana to be cast, including all Warlock pet summons, Druid shapeshifting spells, Misdirection, Resurrection and Blink (in 2.4) spells. The value is dependent on class only, not on race. Don't underestimate this idol. Like the idol of the crescent goddess before it, this can easily be worth several hundred mp5 in certain situations, and easily a few thousand mana over the course of a typical boss fight. Due to the efficiency and power of rejuv compared to LB at 80, combined with the swiftmend glyph which makes it extremely useful to have hots on the tank at all times, I find myself casting nothing but regrowth and rejuv, with the odd swiftmend for clutch healing. Thus until something better surfaces (which could easily be a ways off), this will be the choice idol for raid healing, at least on bosses. I would much rather have this Idol than Idol of Lush Moss, at least at the present time this comment is being made. Why? Because the Lush Moss Idol feels extremely insignificant. I play a druid with 4pc t4, and I feel as if the Idol was a waste of Badges. If I could take my current rejuv, 415 mana cost, and deduct 106, that brings my rejuv to a cool grand total of 309 mana. For as much healing as that puts out, I will gladly throw that on my raid, than hit Nourish with 4pc bonus for an extra 5%, than throw down lifebloom, which will be LESS mana efficient and less healing for the cause. 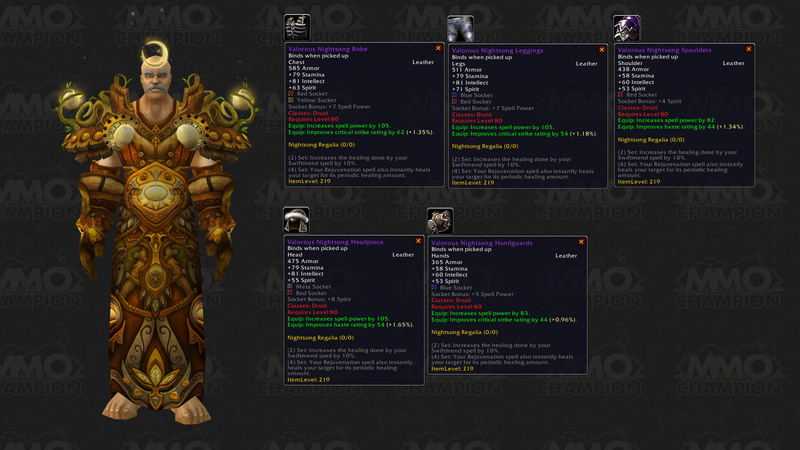 This idol should be coveted by all Resto Druids, the more gear you have, the better this idol looks. Yes, it is better on almost all situations of steady raid damage in conjunction with Wild Growth due to its efficiency, and Lifebloom will not be used on heavy burst raid damage, Regrowth, Nourish and Swiftmend are our tools for that. Plus Rejuvenation allows a better Nourish and Swiftmend on the target. Edit: Thanks to thelovefool for the correction! Nice item, particularly if you find youself running out of mana. With talents, Rejuvenation lasts 18 second, so to keep it simple lets say you cast 3 per minute - keeping it up close to 100% of the time on your primary target. This assumes you are casting on just 1 target with uptime close to 100% - much as you would in an Heoric. However, in raids you are likely to cast it a lot more than 3 times a minute, the more you cast the more mp/5 it equates to. Even though I have Idol of Lush Moss I took this also for those long fights that are likely to ream my mana - although I hardly ever run out. IMHO this is THE idol for Tree healers with 3/3 in Replenish. I dislike using lifebloom in 10-man and 25-man raids since healer mis-communication / mis-coordination causes this my lifebloom blooming portion to be overheal. Besides, why wouldn't you spam Rejuvenation when, with Replenish, obviously has a mana / rage / energy benefit and at nearly the same cost as a Lifebloom with this idol. Most people don't realize that Replenish will proc even if the target is at full health. A side note is this, mana reduction on cast is a guaranteed mana save which means that while you spam it you ALWAYS see the benefit. However, items like Je'Tze's Bell and such do not not scale well with spam healing. Not sure why everyone's numbers above are off, but I've got a 14/0/57 build (all associated rejuv talents, moonglow, etc.). In tree form with this idol my rejuvenation costs 371 mana. With the idol not equipped my rejuvenation costs 446 mana. manacost reduction from tree of life is applied after subtraction from idol. I personally roll rejuvenation (heals for more than lifebloom, takes less mana to cast and isn't as annoying because it doesn't need stacked to be good) on the entire raid when they are taking aoe damage. That makes this idol extremely valuable. While the new Ulduar Idols haven't been revealed yet, the new Tier 8 4-piece set bonus in combination with this idol make for an irresistible combo. The 4-piece set bonus reads: "Your Rejuvenation spell also instantly heals your target for its periodic healing amount." Source. I suspect Trees will be using Rejuv much more often once they get that set bonus, and a (significantly) reduced mana cost for the spell from this idol makes a lot of sense in terms of Tree efficiency. From what people are reporting from the PTR, this will cost 25 Emblems of Valor. I'm not sure why I only see a reduction in cost of 75 mana instead of 106 as advertised. Now, with the addition of Spark of Hope from ulduar 10, you can lower the cost of rejuv down to 341. Happy happy joy joy. These numbers are no longer correct either, idol subtraction takes place before percentage reductions. I don't care to write out the math, cause these numbers are pulled right from the game as of time of post. Let's assume you have the gc lowered to 1 second by talents, buffs and haste. Let's assume there are other healers who deal with tank healing and damage spikes. Let's assume you keep Wild Growth on cooldown and spam only Rejuvenation the rest of the time. The cooldown of Wild Growth is 6 seconds, so you cast 5 Rejuvenations in 6 seconds. Quite impressive idol for raid healing! Maximal possible benefit of this idol would be 375 mp/5 if you are only spamming Rejuvenations (don't do that!). This idol gives you about 20 mp/5 if you keep Rejuvenation up on one target. Just multiply this number with the number of targets you keep Rejuvenation on. This idol is clearly made for raid healing. If you are tank healing, have a look at Idol of Lush Moss. As much as I don't want to get off topic, this healing mentality shouldn't corrupt our impressionable newer druids out there just learning to raid heal. Lifebloom's little numbers can be deceptive when you forget that they're occuring every second instead of every three. Three ticks of one lifebloom stack will be only slightly less than one tick of rejuvenation.The difference in healing per second is marginal. Yes, it costs more mana. That is not a reason to disqualify a spell from use. You do get half of that mana back after the bloom also. Yes, the duration is shorter. That's not a disadvantage if used properly. Get out of the frame of mind that you have to cast one or the other. They're two powerful spells, used more effectively in conjunction. Now, don't get me wrong. Rejuv is a wonderful spell, I try to always keep it up and this idol is what I equipped most of the time until my gear level was to the point that mana was less of an issue than healing power. Lifebloom, however, should not be overlooked, even at one stack. I use single lifebloom stacks on several hard modes. Most notably, Mimiron phase 2, Freya before a ground tremor, and Vezax. By thinking ahead and applying a single stack to the right players in a raid, the burst heal can counter the most challenging aspects of a hard mode. Timing the burst to come immediately after a dangerous ability can make or break a difficult encounter where the prime resource to be managed is healer cast time. It takes other healers time to cast their heals, and this allows everyone to keep up. Too many druids neglect the burst component and focus solely on the HoT component, but doing this is to neglect one of your most significant heals. For any druid planning to heal hard modes, you have to focus more on the impact your choice of spells will make during critical moments, instead of whether you have rejuv on everyone so you can top the healing charts. Also, even though this should be obvious, it seems it's not being taken into consideration. You don't have to stack to 3 immediately. As I pointed out above, even a single stack of lifebloom delivers a significant amount of healing for its duration. But also, the application of another stack refreshes lifebloom's duration on the target, giving the spell incredible healing-per-mana efficiency when stretched in this way, and allowing you to tailor the healing per second on a target by target basis, all with the constant reassurance that the target will receive a custom-fit burst heal soon without anyone's direct intervention. So resist the temptation to stack lifebloom to all or nothing. See it for what it is: a customizable heal with great versatility and many applications. Druids are not popular healing choices on many hard modes due to a lack of a tank saving cooldown, and the hard mode emphasis on cooldown rotations coupled with the dps requirement. Some 10 mans won't find room for them at all. But, if you master the versatility of your spells, and the many ways they can be used in combination, you won't need a cookie-cutter raid composition built around priest cooldowns to beat the hardest of hard modes, believe it or not. Druids have multiple HoTs for a reason, and they all have their place. Try mindlessly rejuv spamming on a hard mode and you'll find out how little you're really contributing, especially in a 10 man where you don't have raid positions to waste on talentless HoT-bots. I'm disappointed that few people still support this relic. I believe it is amazing, since mana regen isn't something that resto druids are ever strongly encouraged to gear for. This relic takes the cake for any mana conservation upgrades that you would sacrifice SP/Haste for IMO. When using this baby, I can usually toss my unglyphed innervates around raid. I love this idol and don't plan on switching anytime soon. Since this is by far our most used raid heal, it seems a no-brainer. It may not have the utility of adding health to our heals, but its mana conservation value is amazing. Thumbs up for the golden chicken! Before idols were turned into more gear that needed to gemmed, this idol decreased the mana cost of Rejuvenation by 106. Late edit, but as of 5.0.4, All relics, throwns, and wands serve barely to no purpose to your characters.